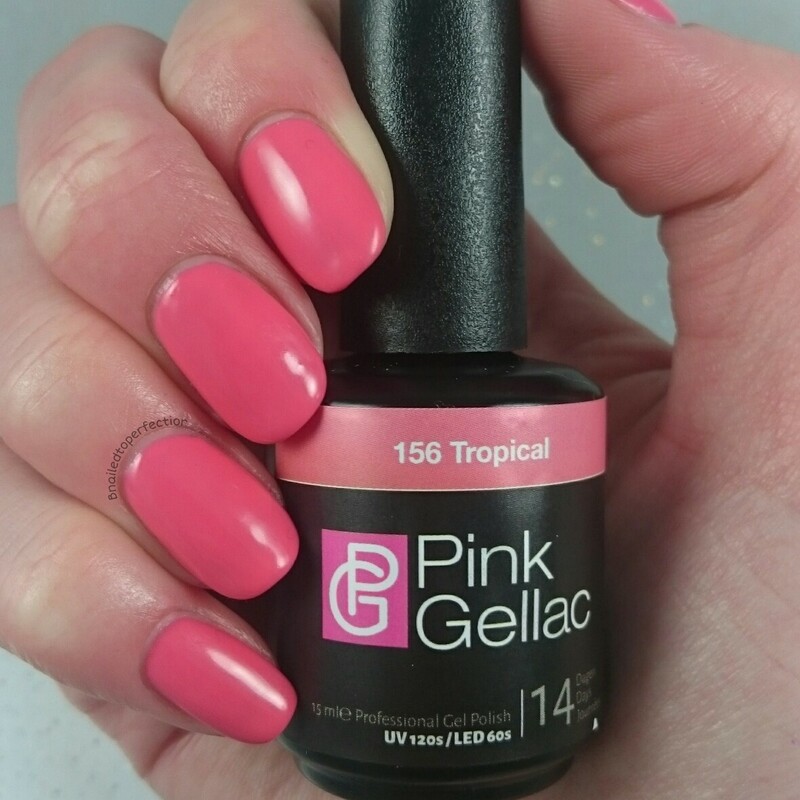 Type the Hype recently got in touch with me about reviewing the Pink Gellac starter kit. I had seen this brand a lot on a blog that I follow called Chickettes. I've been intrigued by it before so I said yes. As you can see from the picture above you get three 15ml bottles. A base coat, colour coat and Ultra Shine no wipe top coat. You also get a 50ml nail cleanser, a nail file, orange wood stick, lint free wipes, 20 remover pockets, an LED lamp and of course some instructions. The instructions say to scrub your nails with the pink side of the nail file but I don't like to do this and have never needed to with other gel polishes so I skipped this step. So I cleansed my nails and then moved onto applying the base coat and curing for 15 seconds. Then I applied the colour coats and cured for 60 second for each layer. Once I was happy with the opacity I applied the top coat and cured for 60 seconds. Some colour may come off onto the brush but this is normal. 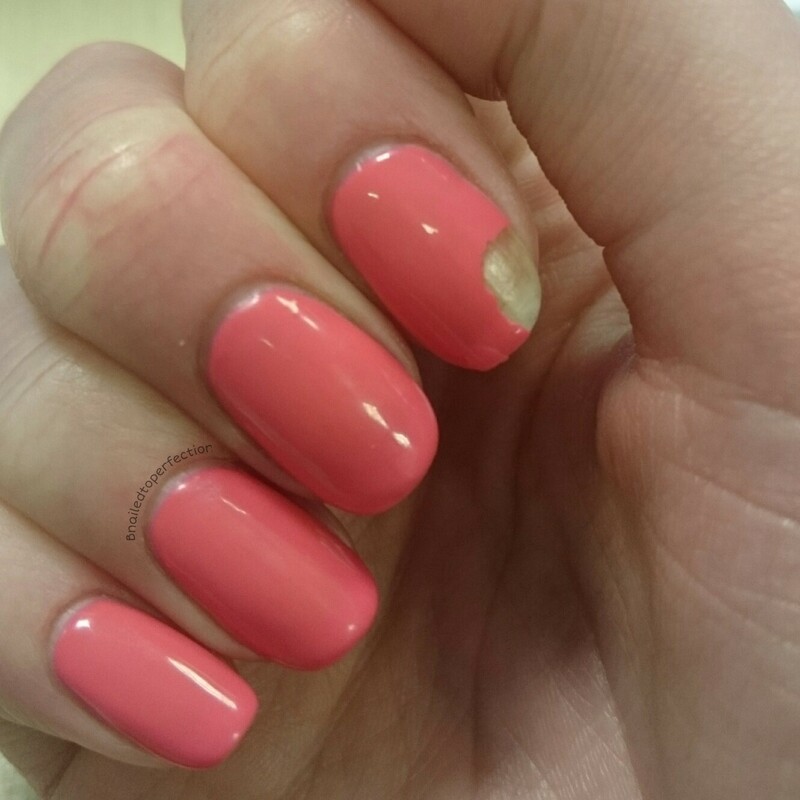 You do not need to cleanse the top coat after it has been cured. The colour that was in this kit was Tropical. A lovely pink with a coral hue. My swatch is three thin coats. I found application a tad streaky but what's great about this polish is that it is self levelling. I did try to do a wear test on my Cindy hand but it didn't go well. The instructions say that if you have soft or brittle nails and if you are in contact with water a lot, you need to apply Pink Primer before your base coat. This isn't included in the pack so I couldn't test this but I don't have brittle or soft nails. I experienced my first chip on the day after application. I took a quick snap at work. My thumb had also started to lift but I did expect this as I had cleansed the top coat to test it. 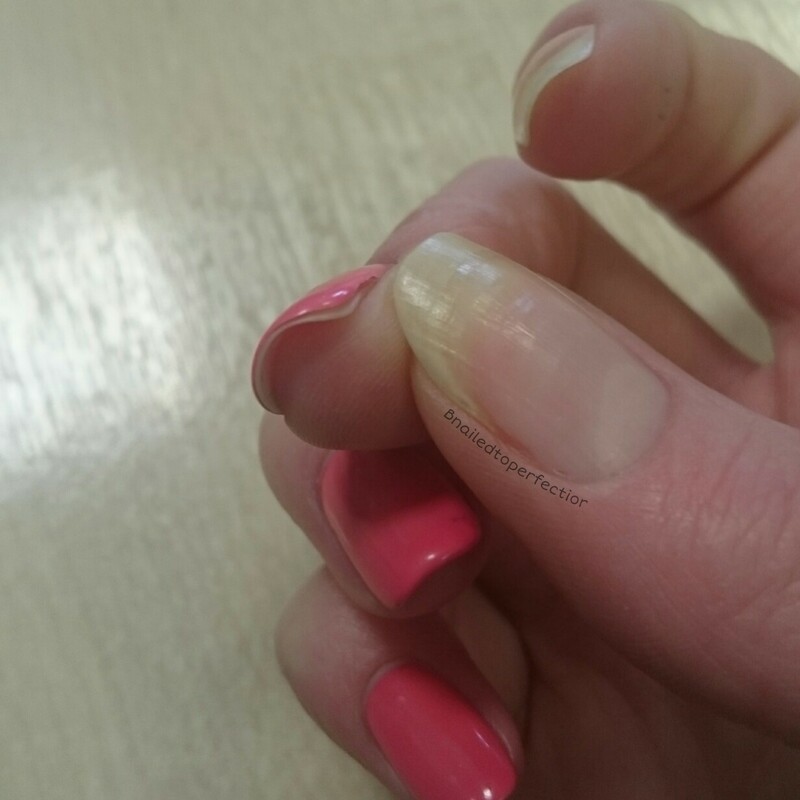 Then the middle nail started to lift on the second day. By the fourth day my ring finger started to lift so I ended up removing the remaining nails. The remover pockets were quite handy as they have a glue line so you can wrap it around your finger and it helps it stay in place better. It removed ok in 15 minutes. There were a few things I liked about this kit. The lamp is cute and works well. The colour is very pretty and the whole kit is a great price at £54.99. However, I didn't like that the lamp doesn't have a timer for the base coat so you have to time 15 seconds to ensure you cure correctly. The polish was streaky but it did self level. I found that the top coat was tacky for quite some time after I completed the mani and found myself washing it quite a lot. This may have a lot to do with the bad results on the wear test. Unfortunately this wasn't a good product for me. Everyone's nail chemistry is different and I have seen great things about Pink Gellac. Have you tried this brand before? What do you think to the kit?